Tickets for the upcoming BlizzCon 2010 will go on sale in two separate batches in June, doubling fans' chances of missing out on one of the year's premiere gaming events. 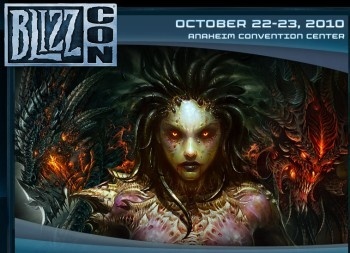 BlizzCon 2010, a celebration of all things Blizzard, will take place at the Anaheim Convention Center in Anaheim, California on October 22 and 23. "BlizzCon is a unique opportunity for our players to meet one another, strengthen the friendships they've formed online, and have a great time celebrating a shared passion for gaming together with Blizzard employees," said Blizzard Entertainment co-founder and CEO Mike Morhaime. As in past years, U.S. fans unable to attend will still be able to take in the show through the DirecTV BlizzCon Pay-Per-View event, which will cost $39.95 and provide live coverage of both days of the show. For the first time ever, the PPV event will also be available as a multi-channel internet stream that will let viewers switch freely between coverage of different areas of the convention. The online PPV stream will run $39.95 as well and will be included at no extra charge with the purchase of the televised PPV event. Tickets to BlizzCon 2010 will go on sale at 7 pm PST on June 2 and then again at 10 am PST on June 5 for $150 each and, according to our resident Blizzard expert, will sell out in approximately 30 seconds. For more information, check out BlizzCon.com.